Out of the three, adding a new service makes most sense, as it would take less time and money. However, that doesn't mean it should take less planning. 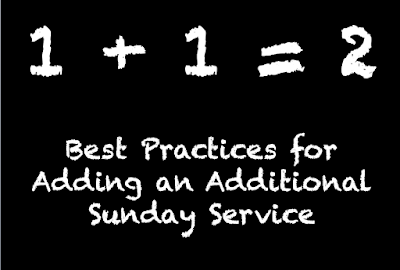 There is a lot of value in having more than one Sunday gathering each week. In addition to utilizing your current space and facilities, it can create energy, momentum and gives people options. I try to attend at least two or three leadership conferences each year. There is a lot of value in hearing talented, gifted people share their stories and experiences. In addition to hearing great speakers, the conversations with other attendees are priceless. Some of my greatest learnings and takeaways have happened over a cup of coffee in-between sessions with like-minded leaders.